Kids will enjoy the lights, colour and mesmerizing spectacle. Adults will appreciate the humour, technology and high energy entertainment. 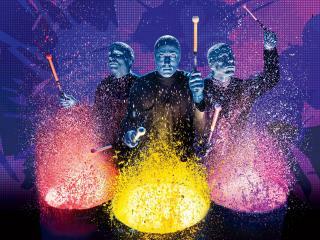 And because the show is performed with no spoken words, Blue Man Group is perfect for all languages and cultures. While the show appeals to a wide audience, it may not be appropriate for all children under three years old. Custom built for Blue Man Group, the state-of-the-art theatre is located in Universal CityWalk™. If you sit in the first four rows of seats (aka “the poncho section”), you’ll get a poncho because you might get splashed with (washable) stuff used in the show. With 1,000 seats, a 30-foot Blue Man facade, state-of-the-art lighting, video and sound systems, incredibly vibrant colours and live music, you can expect a fun-filled experience like no other. The Blue Man Group Orlando show is performed throughout the year in Universal CityWalk™ and lasts around 1 hour 45 minutes. Show times vary from 6.00pm to 9.00pm depending on the time of year. Seating Information: The Blue Man Group Theatre is broken down into 2 main sections – Tier 1 and Tier 2. Seats are allocated on a ‘best seat available’ basis and the majority of Blue Man Group tickets will be in the Tier 1 category. All seats enjoy excellent sight-lines. Prices, dates, times and entertainment subject to availability and may change without notice. Other restrictions may apply. © 2018 BMP. Blue Man Group Photo by Lindsey Best. Universal elements and all related indicia TM & © 2018 Universal Studios. All rights reserved.